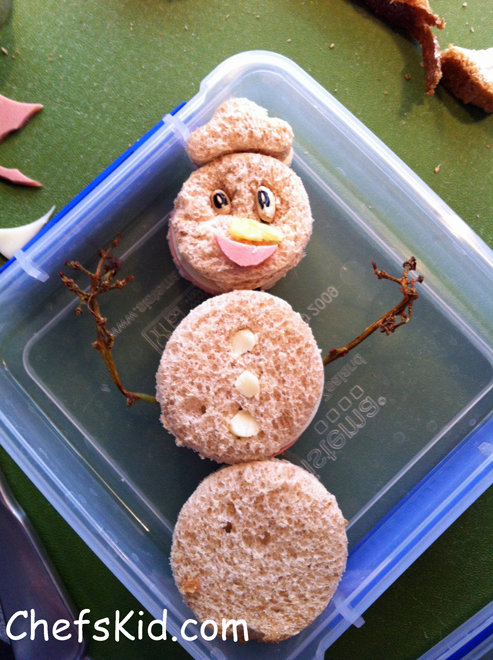 I know it’s a little too early to be thinking about snow, but this cute Sandwich Snowman is good for a smile any time of year. This is a bologna sandwich snowman. I use kosher bologna (because I don’t think there is such a thing as organic bologna, so kosher is about as close as you can get), whole wheat bread and low-fat mozzarella cheese slices. Just make the bologna sandwich as normal, then use round cookie- or biscuit-cutters to make the body and head. Sometimes it’s easier to cut the shapes before making the sandwich, so do whatever’s easier for you. Cut a little hat out of the scraps. Sandwich Kabobs are a fun twist on a regular sandwich. And, for my Kid, it’s about the only way he’ll eat lettuce! In this case, I did a couple of different sandwich fillings: pepperoni and deli meat chicken. He doesn’t like the deli meat chicken in a sandwich, but for some reason on a stick it’s okay. To make them: First take a slice of bread and cut off the crusts. Then cut the remaining bread into 12 squares. Take a string cheese stick or two and slice them so you have 2 or 3 rounds per kabob. 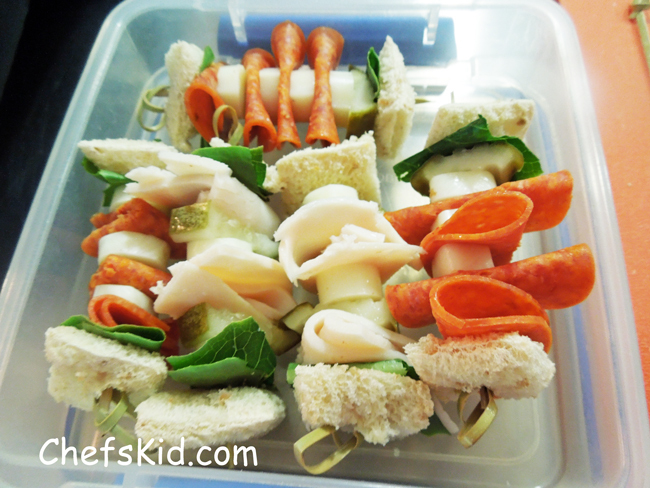 Cut Sandwich Stacker pickle slices into 1″ chunks or use small 1″ round pickle slices, enough for one per kabob. Tear lettuce leaves into small 2″ diameter chunks. 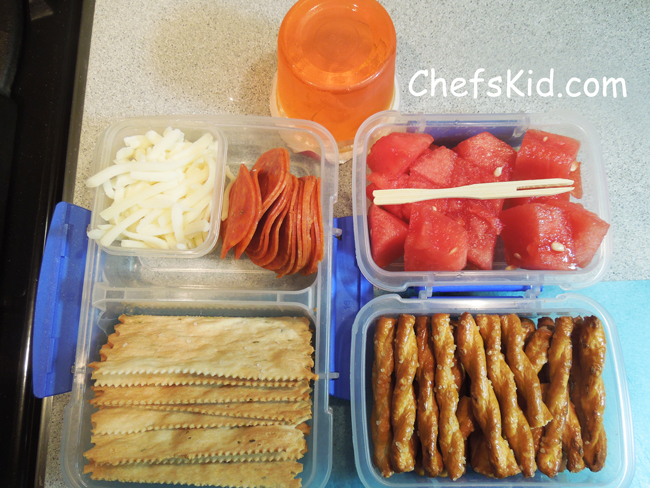 Get 5 or 6 bamboo appetizer picks (or lollipop sticks or other small skewers). Slide them on in any order you like, but I did: bread, lettuce, meat, cheese, meat, cheese, pickle, bread. I also vary this a bit based on the fillings. For example with the deli meat (which he doesn’t like so much) I add extra pickles. With the pepperoni, I sometimes add extra cheese. They are not all the same as you can see, and that keeps him more interested in going in for another one. 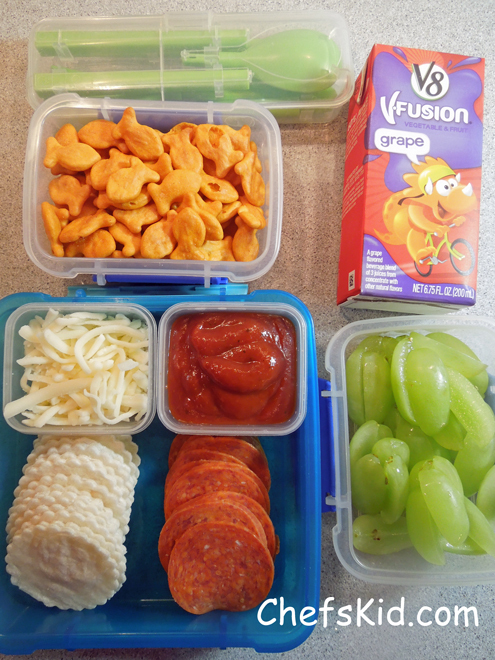 Pizza Stackers are another take on homemade Lunchables. Use tortillas as the pizza crust, and mozzarella slices, cutting each of them to size with a biscuit cutter or cookie cutter. I also found a cute little squeeze tube at a gourmet kitchen store that I filled with pizza sauce instead of putting it in a cup. He liked the squeeze tube so he could draw faces on the stackers. And he’s responsible enough to keep track of the lid. We have ones with attached lids but they’re too stiff and don’t squeeze very well, so this one gets used a lot. Fair warning though, pizza sauce stains it, so you can’t really use it for much else afterward. For variety, you can send them already stacked, or split into groups (all the pepperoni together, etc. ), or assemble them -sauce and all- at home. You can vary the shapes and really get creative with them. He would eat nothing but these if given the chance, so we tend to re-use this one a lot in different ways. Remember “Happiness is a Warm Puppy” from Charles M. Schultz? And if you’re a state fair goer, you remember some version of the Pronto Pups corn dogs, right? Well, Warm Puppies are a little bit of both. They’re hot-dogs on a stick – like the fair version, but smaller and without the corn batter. Hence, ‘puppies’ instead of dogs, they make Kid happy, and we serve them warm, so… you get the idea. People love food-on-a-stick and kids are no different. Simply quarter a kosher hot dog and slide a sandwich pick, popsicle stick, or other 3″ – 4″ skewer into the cut end leaving plenty of room for a handle. Microwave for 30 seconds at the most. Serve with organic ketchup and organic carrot sticks. Seriously, though, they can’t be any easier: Take a flour tortilla. Sprinkle an ounce or so of your choice of shredded cheese (we do mozzarella) on the tortilla (just one side). Heat in the microwave for 25 seconds (or until cheese is just melted). Take it out, and add a layer of pepperoni (about 6 or 7 slices) leaving some room at the edges. Fold opposite sides toward the middle so it looks like an open-ended burrito. The whole thing takes less than 2 minutes. Serve with pizza sauce for dipping. One trick about the apples… notice how they’re tucked into one another like a weave pattern?? This is the best way I have found to get a whole apple into a flat sandwich container. See, my Kid doesn’t like to eat whole apples. The peels get stuck in is teeth, etc. So, I have to cut them and this pattern fits even those huge organic Honeycrisp apples. Apples are his favorite, so we do this a lot! I once asked on Twitter “How many days in a row can a child eat Pepperoni & crackers before blowing out his colon?” Apparently quite a few since he eats this all the time, for several years running, and said colon explosion has not yet happened. This is another cheat day for me using the store-bought Jello. I haven’t yet found a way to make Jello in an organic or otherwise healthy way, so it gets relegated to the dessert list. Not totally sent to the ‘naughty’ list though. If you have thin or weak hair and nails, making Jello a mainstay in your diet can work wonders to remedy that. True story. We love these rosemary flatbread crackers and you’ve seen them in other lunches here. 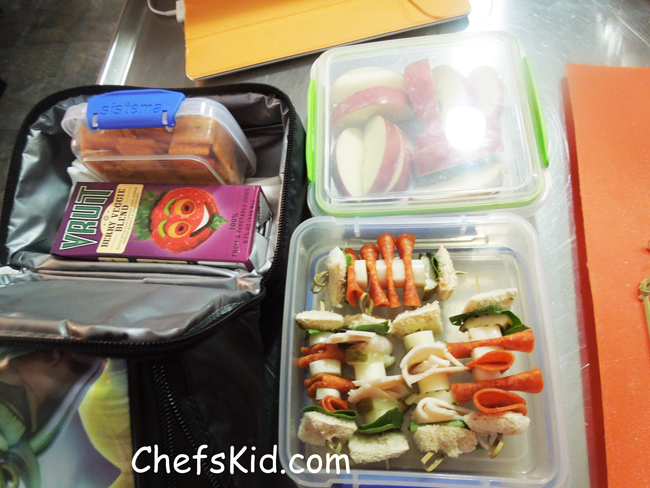 We make an olive tapenade that he clamors for (but won’t let me send it to school… hmm.) that we eat with these crackers and it’s a heavenly combo. One of the few things all three of us go ga-ga for. I’m cheating with the chicken fries here… these are the Tyson brand of frozen chicken sticks. So not organic, not free range, or any of the things I usually insist upon. I could – and sometimes do – easily make these at home but Chef brought them home one day and they have been a special treat ever since. They’re kind of a special treat for me, too since they cook in about minute in the microwave. Since they’re on my ‘naughty’ list, I sent them with organic ketchup, matchstick-cut organic carrots, and organic cantelope (locally sourced) cut into little gingerbread men shapes using my Pop Chef cutter. A little naughty and a lot of nice makes for a better balance in my mind. A little trick with the cantelope… sprinkle with a hint of cinnamon sugar if it’s not super-sweet. You know how sometimes you get anxious and cut that thing open before it’s reached its full sweetness potential? Cinnamon sugar does the trick. 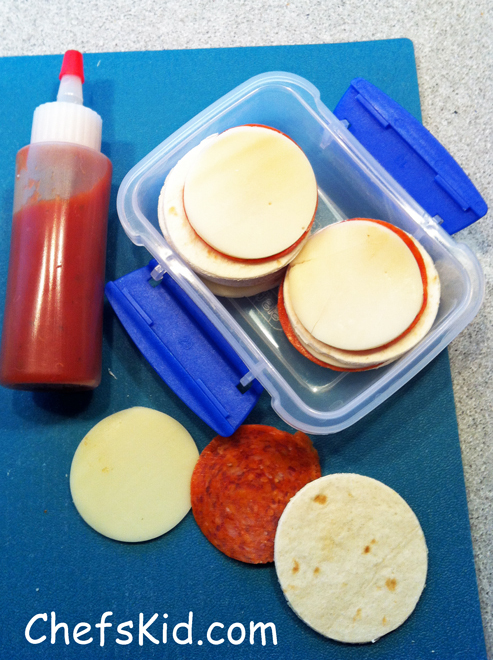 Mini Tortilla Pizzas are ChefsKid’s version of homemade pizza lunchables. The crust is made from cutting flour tortillas with a scalloped-edge 2″ biscuit- or cookie-cutter. It’s slightly bigger than the size of the prepackaged pepperoni. 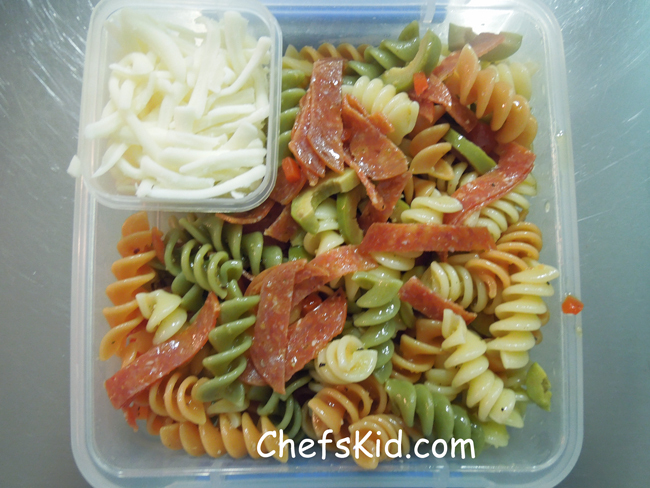 We add organic pizza sauce and low-fat mozzarella cheese in 2oz containers (with lids – not shown) inside the shallow sandwich container and can fit a lot in there. Way more than you get if you buy the prepackaged kind. Grapes are cut in quarters so you can fit a lot more of them in there and round out the food pyramid. 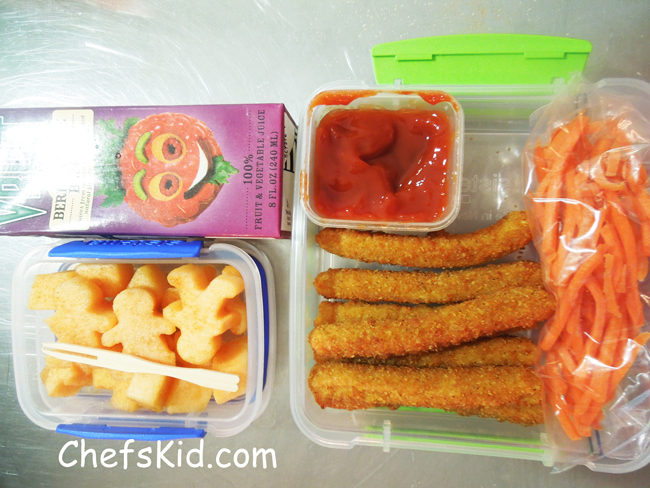 Goldfish crackers make a great snack during class and you can fit a surprising number of them in the 200ml container. Sistema also makes this great silverware pack. It has two handles with interchanging tops of fork, knife, spoon, and chopsticks! It’s so clever! Not to mention handy and easy to wash and reuse. 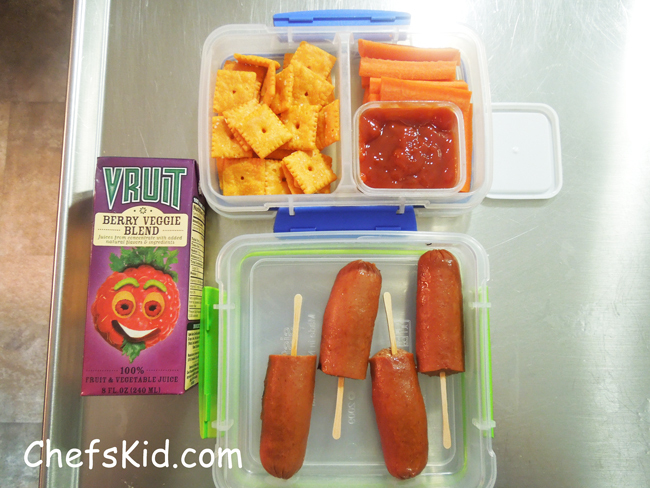 Since Kid is a pepperoni addict, this is one of his all-time favorite lunches. 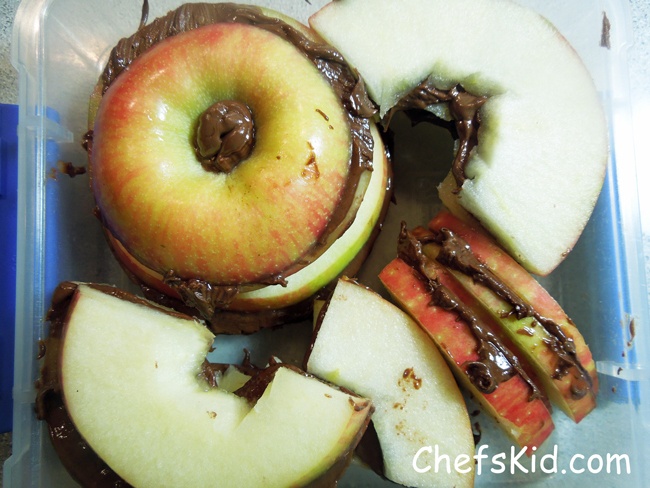 The Apple and Nutella sandwich was a HUGE hit. 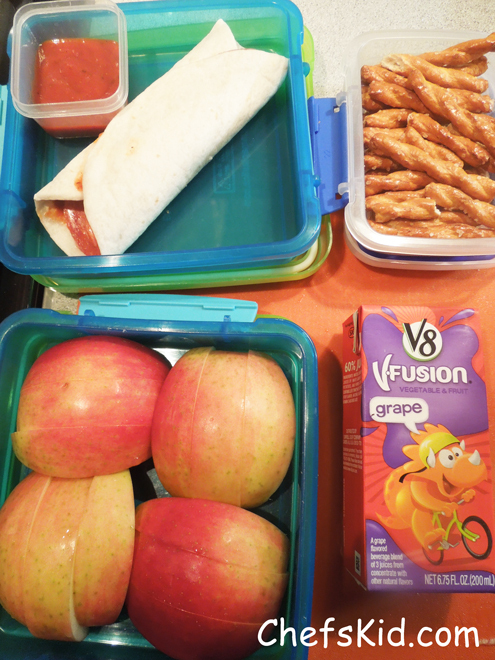 Even though it was really hard to eat because I put the Nutella on at home and it all slid off the apples by the time lunch arrived. Next time I will put the Nutella in a cup and give him a spreader to do it himself. The idea here is that the apples are the ‘bread’. Otherwise, it’s easy enough to do. If you have an apple corer, that’s ideal. If not, slice the apples perpendicular to the stem… so that each slice has the 5-star shape of the seeds in the center. Then you can cut them in half so they fit in the container better if need be. One trick to keeping apples from getting brown is to spritz them with organic lemon juice. If you take the time to buy organic apples like I do, it doesn’t make much sense to sprinkle them with chemicals like Fruit Fresh or even powdered lemonade. Although, I have used both and both work well. The lemon juice works great, too, but don’t overdo it or it will impart a lemon flavor to the apple.